My dudes, there has been an update to the WordPress app and now I can’t find the add caption button. Had to drag out my laptop to add this. If only I had some way of searching to access a world of knowledge that might tell me…..
Time to lay down some quick thoughts on Smoky Quartz before the dawn of spooktober, as this is a perfect ink color for the pumpkin spiced season. It’s got just enough shading when writing regularly to keep me delighted while still remaining a nice, professional, time-to-stomp-on-some-leaves-and-chug-spiced-wine brown. No real sheen to speak of, but I’m content to have nice shading. You got me, Pelikan. 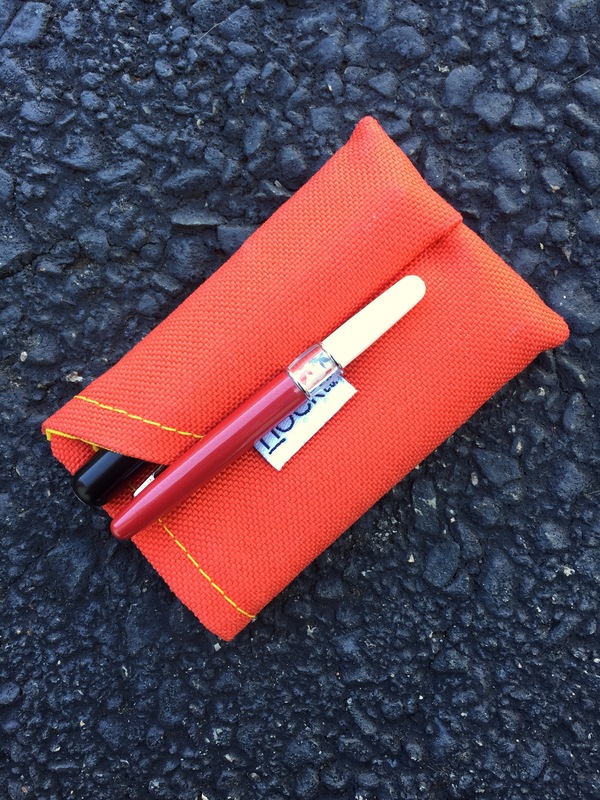 This is the littlest member of the Nock family, designed to hold a Kaweco Liliput (or similar small writing implements) and business / tiny note cards. All the same wonderful materials as I’ve touched on before, in an itty bitty body. Since this is a Nock case, one must immediately load it up with more than the designated amount of goods. You actually have to put some effort in to get something to start coming out of the case. It held onto everything wonderfully when it fell out of my motorcycle jacket pocket, and because it was so brightly colored we spotted it right away rather than it getting left at some outlook along the Blue Ridge Parkway. The DotDash notecards are an excellent balance of the characteristics wanted for EDC. I love the unobtrusive dot and dash grid. Though the lines of writing are not tight and crisp like I like, there’s no bleedthrough up there, not even with the Copic or the Sharpie markers. 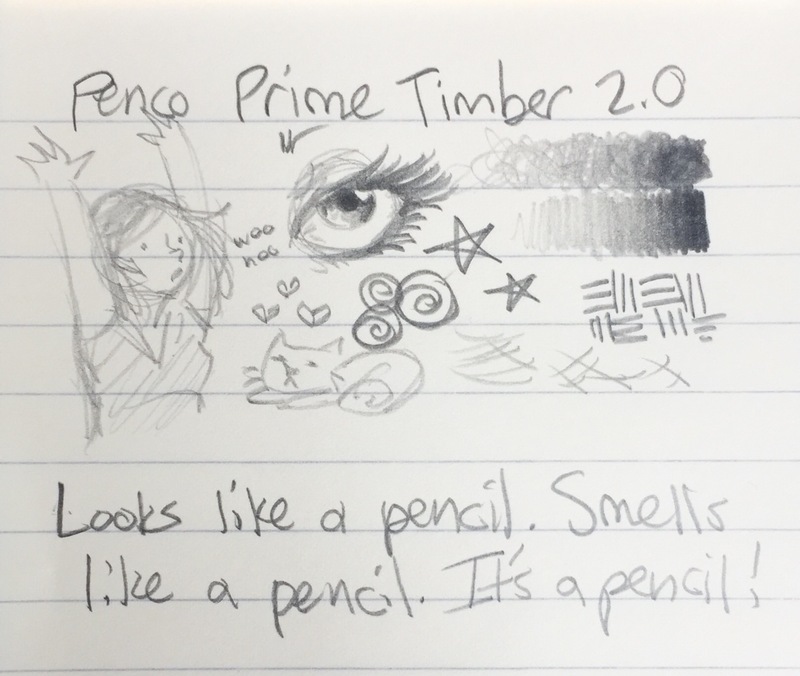 The dry time is quick (about 3 to 4 seconds), which is great for making quick notes with fountain pens especially, and you can see all the sparkles in the Emerald of Chivor ink. Sure I wish there were more shading and crisp lines of fountain pen ink, but I don’t think I’d trade away something like the drying time to get it. 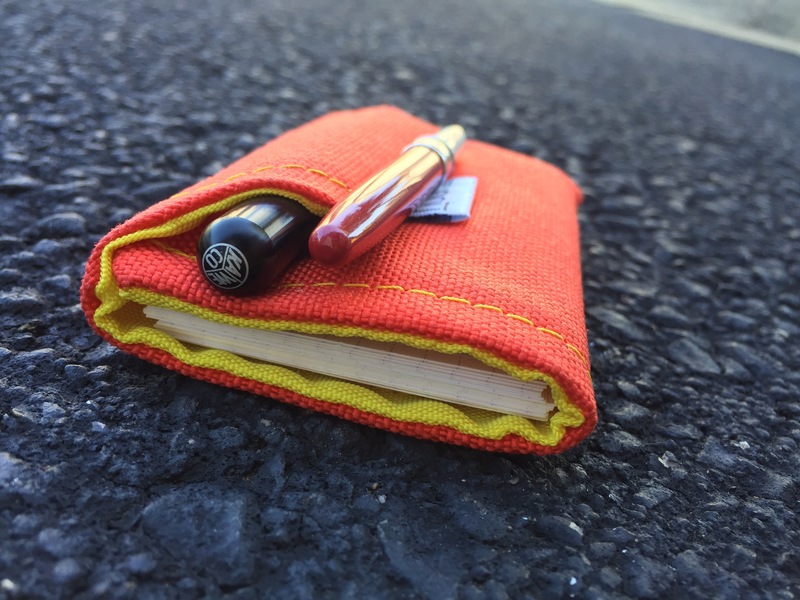 Because it’s so small, the Fodderstack Mini is easy to grab and throw in a pocket, or carry in my hand; any time I am going somewhere away from a home base of stationery goods this provides a quick way for me to be reassured that I have some good paper and pens with me if needed. That’s why it’s become my stationery security blanket—someone wants a quick word at work? I don’t need to bring a notebook? Au contraire, silly other people, pens and paper are as essential as shirts and shoes. I grab the little Fodderstack and I am instantly prepared. 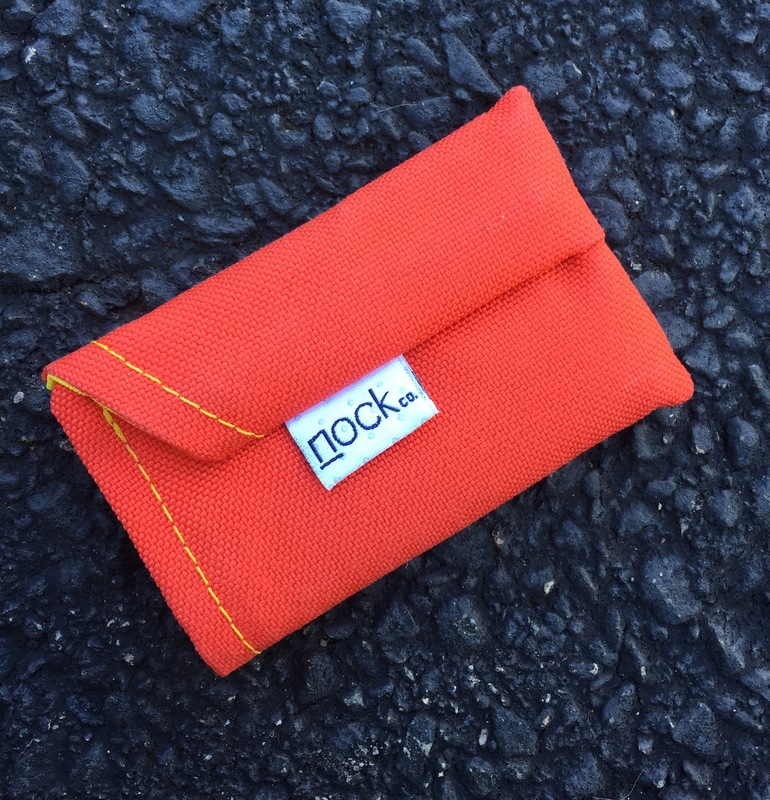 Being a limited release, the Fodderstack Mini isn’t available on the Nock Co. website right now. 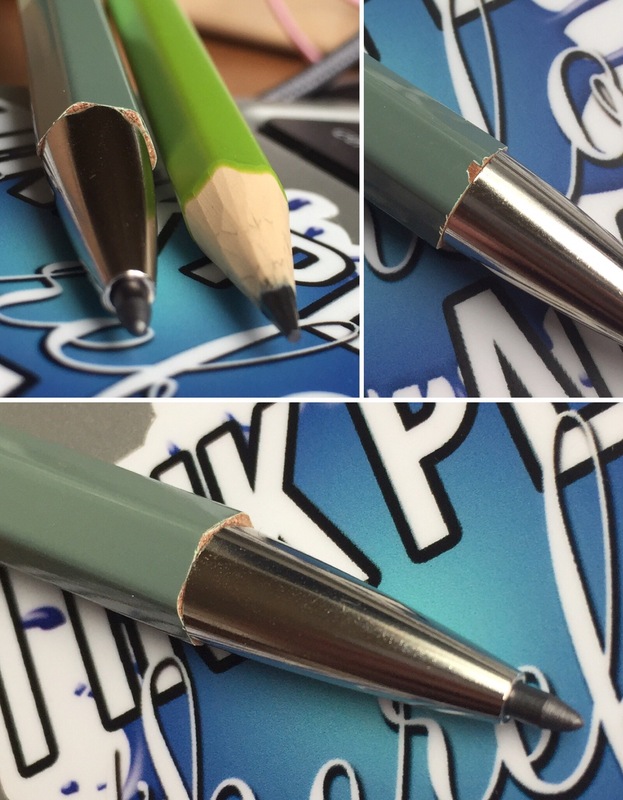 But hopefully there will be more batches, if not as a regular product then as a special goodie to acquire at pen shows. Thanks Brad for my lil buddy! I’m SORT OF trying to be SOMEWHAT more responsible this year in terms of gratuitous purchases, and focusing instead on enjoying the pens, papers, and inks I already have. So I don’t know what exactly Tom wrote in the Ink Flight announcement for May that made me overcome my sense of responsibility and decide that I had to have whatever extra mystery item was, but good job. The wheels of capitalism thank you. My particular Ink Flight box decided to take some extra layovers through the US Postal Service for whatever reason, but Tom was super helpful in making sure my Ink Flight got to me (also super helpful in getting me sorted out when I somehow managed to accidentally place my order twice when trying to use ApplePay while half asleep). Prompt A+ customer service. In spite of unforeseen flight delays, none of the surprise was spoiled for me online. A+ nice pen and ink community. 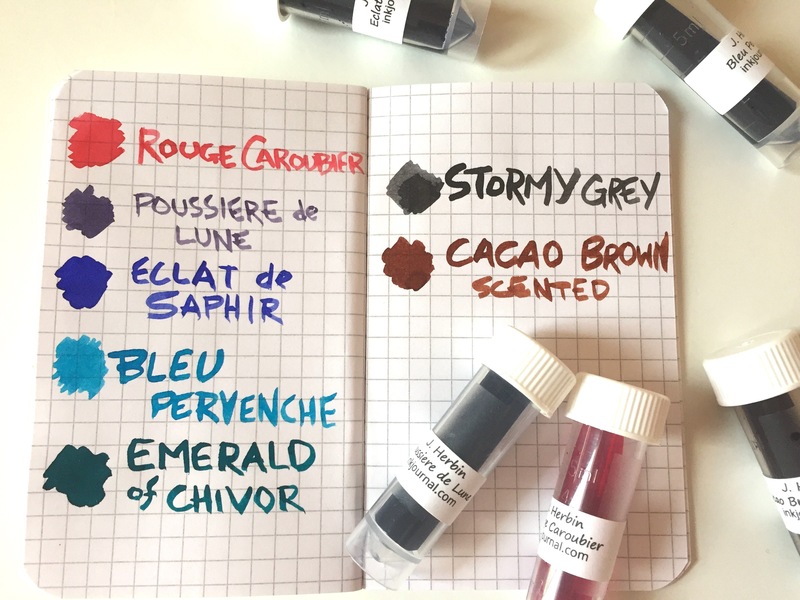 The Ink Flight Box #4 came with 7 samples of J. Herbin ink — 4 regular colors, 2 special edition sparkly 1670 colors, and 1 scented color. All in all I think as good a representation of the brand as one can be expected to fit within 7 samples. 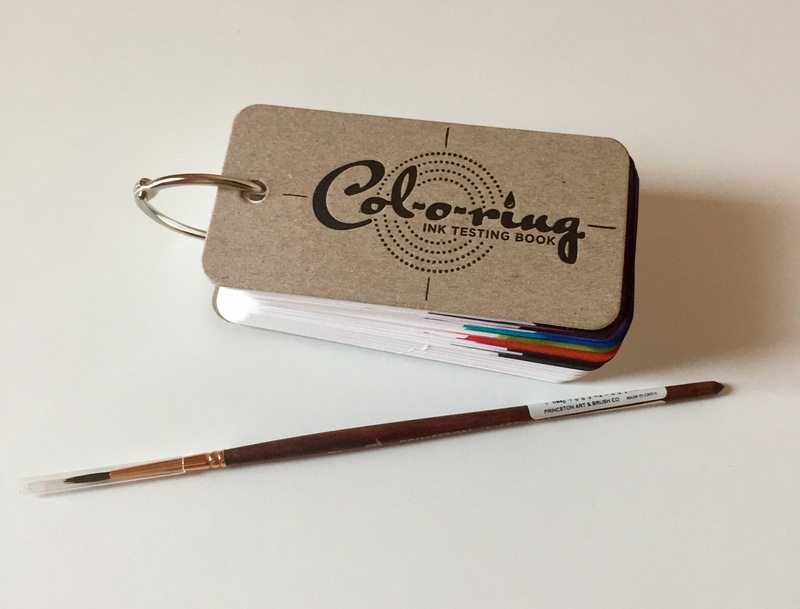 Also included in the box: a Col-o-ring Ink Testing Book and a Neptune watercolor brush. The mystery items did not disappoint. I made squealy noises of excitement. My feelings toward J. Herbin inks have been all over the place throughout the years. I bought three bottles early on (Gris Nuage, Diabolo Menthe, and Vert Reseda) and some cartridges (Poussiere de Lune, Ambre de Birmanie), liked them well enough, then decided that they didn’t have enough shading or saturation for my tastes at the time and didn’t use them for a few years, got hooked on the 1670 anniversary editions (starting with Stormy Grey, the reformulated Bleu Ocean, and so forth), and have since gone back to my original bottles (plus a holiday gift of a bottle of Rouge Caroubier) and am loving them again. 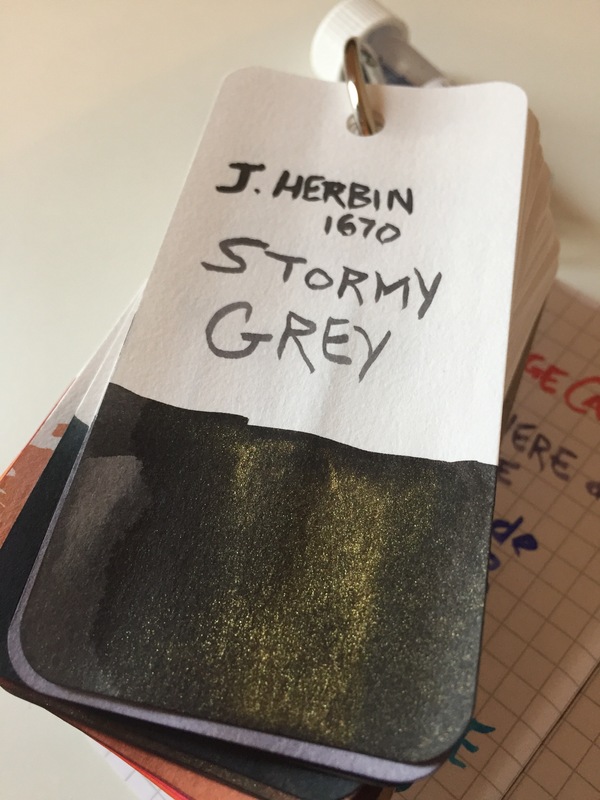 It’s a good time for more J. Herbin to come back into my life, even if only 3 of the samples are new colors to me. 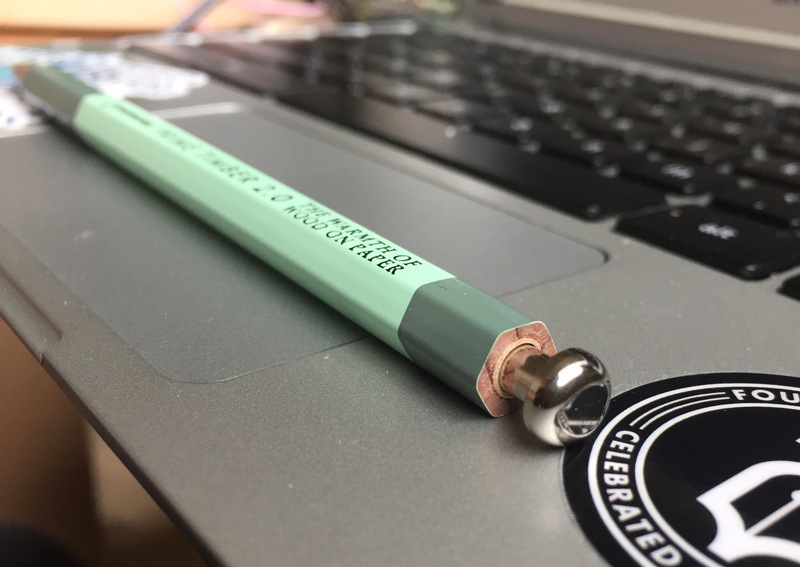 Emerald of Chivor — still haven’t reviewed it, though I have mentioned it in other reviews. It is magical and using it feels like I’m staring into the cosmos. It fills me with joy and I have no complaints against it. Stormy Grey — love the shading, love the sparkle. I even have Stormy Grey in my bamboo brush pen right now. It’s like me: seems professional, but then the light hits it just right and you can see the mad gleam of insanity glinting in my eyes charming sparkle. Rouge Caroubier — a very lovely slightly-pinkish-coral sort of red. Nice for spring and summer especially. Not a lot of very noticeable shading though. Poussiere de Lune — a nice dusky purple. Writing with the paintbrush, it seems to have more shading than I remember when I last used a cartridge of it. Eclat de Saphir* — what a vibrant blue! Much like Lamy Blue, but a bit more vibrant at its most saturated. Writing with the paintbrush has significant shading from a very vibrant blue to a slightly more muted one. I am intrigued to see how it will behave once I get it in a pen. Bleu Pervenche* — it’s like a sky blue turquoise! The closest color I already have to it is Monteverde Turquoise, but not a lot of shading when writing with the paintbrush. I prefer turquoise and similar blues with more shading. But the color is so lovely, I’ll give it a chance in some pen on my next go-round of inking. Cacao Brown* — it smells…kind of like vanilla extract?? But not quite. I like it. I don’t know that I really like this particular brown color. Can I add this scent to some 1670 Caroube de Chypre? That would be perfect. Neptune #2 Round Watercolor Brush — found it quite easy to use and write with. Could never seem to get it fully clean though. I’d think it was clean, and it would be clean on most of it except if I put a paper towel to where the bristles go into the metal ferrule (or whatever you call it), I’d always draw out a bit of ink. There’s probably ink stashed away up in there forever now. But using it didn’t seem contaminated with other colors so I’m just hoping for the best. 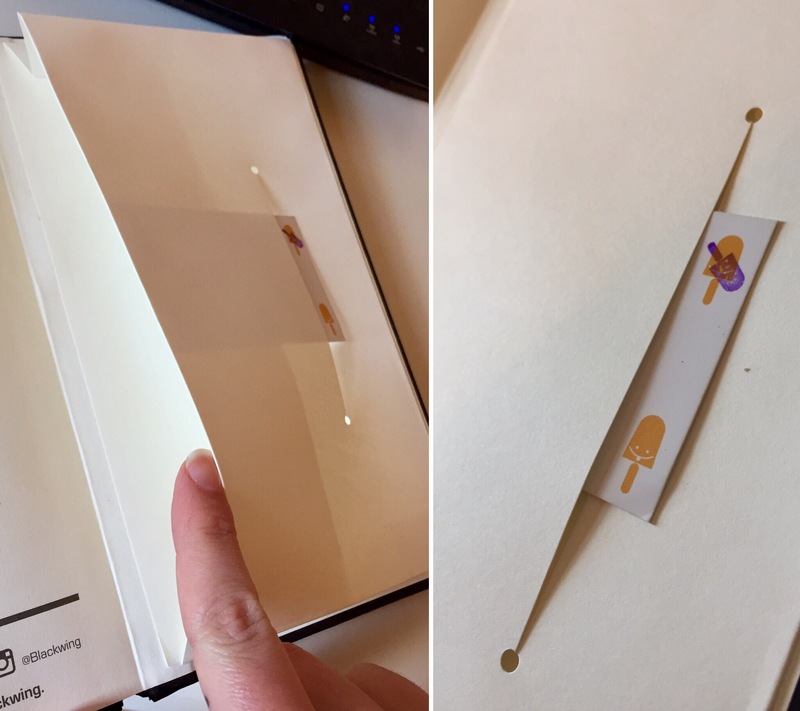 Col-o-ring Ink Testing Book — heckafreaking amazing. I am so excited to have one. 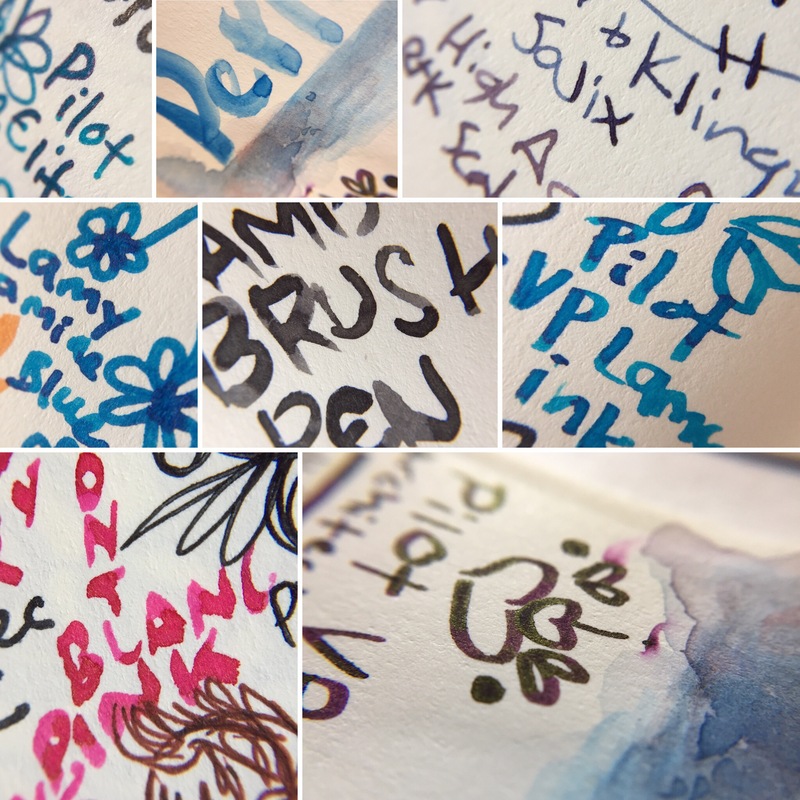 I’ve already done swatches of every bottle of ink I own, Leigh Reyes-style, and am happy to report I own less than 100 bottles of ink and therefore have room to grow. More about the Col-o-ring by The Well-Appointed Desk here. All in all a very satisfying purchase. I got to experience new colors, I gave away the two 1670 anniversary ink samples to a friend and spread the love, and I have a Col-o-ring now! The Ink Flight isn’t a subscription, so if I decide to go back to being responsible there’s nothing else I need to do. And if I decide I gotta have it, I can hop back on. 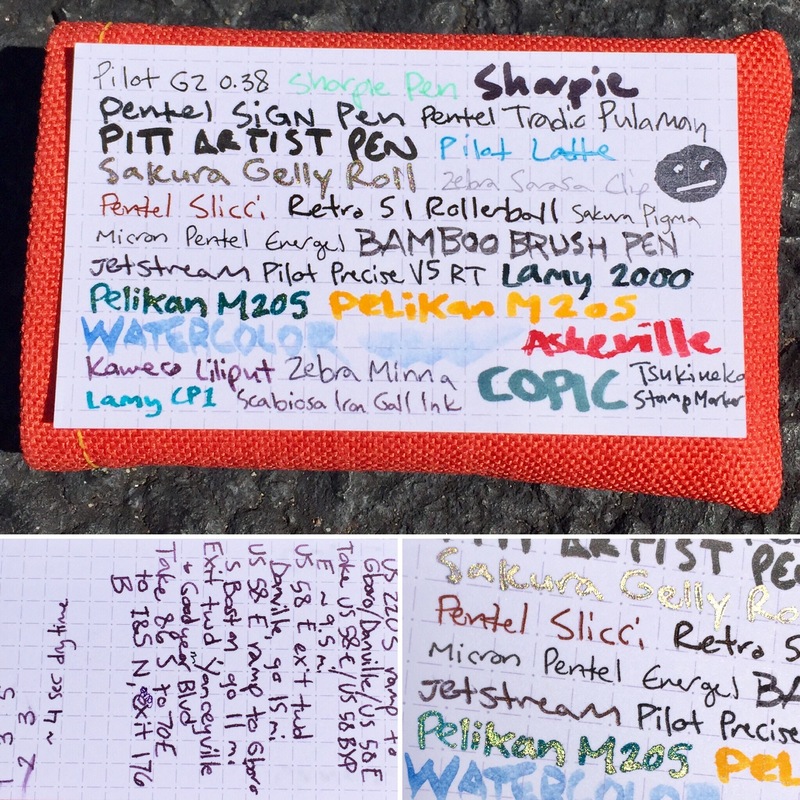 The differently priced options for an Ink Flight are 1. just the 6 samples; 2. the Starter set including the 6 samples, a bonus sample, an InkJournal Black notebook, and a random piece of InkJournal swag; or 3. the 6 samples, bonus sample, and surprise mystery item(s) for fountain pen and ink lovers. 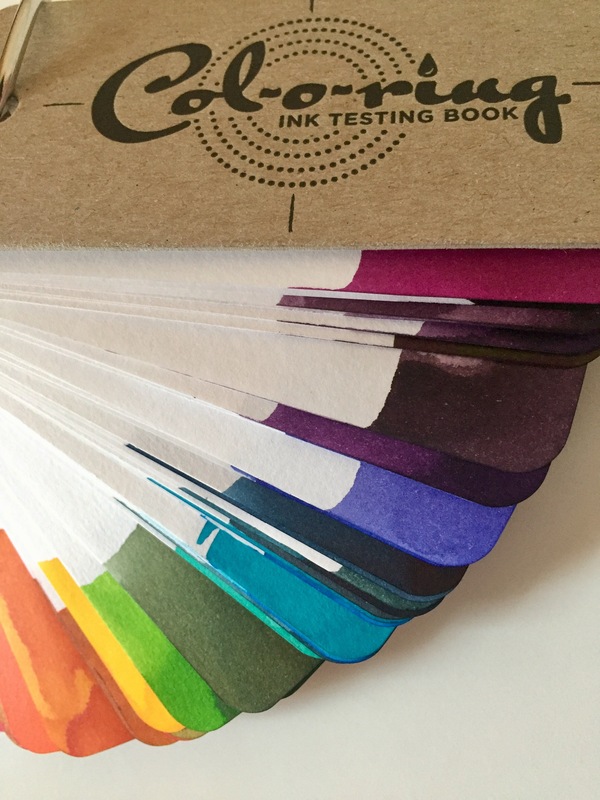 The next Ink Flight is available to order now and ships out this Friday, June 2nd! Lays flat. Is notebook. Ok, I think we’re done here! 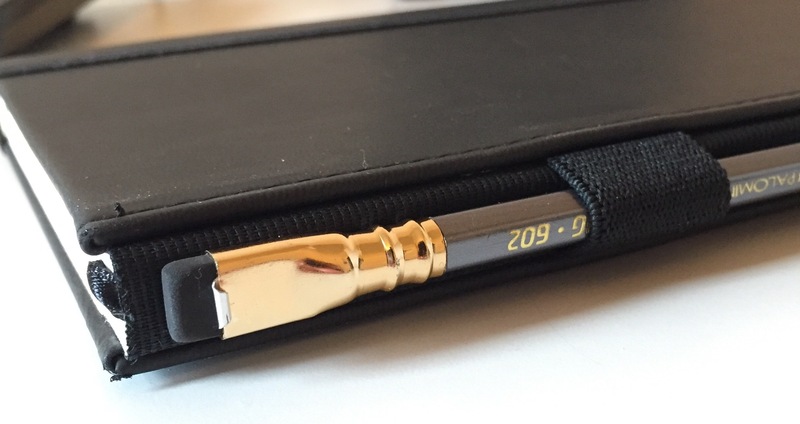 While I’m still not certain I’m certified cool enough to own any of these notebooks, Denik has once again reached out to me to give my opinion on their latest release, the Layflat notebook. 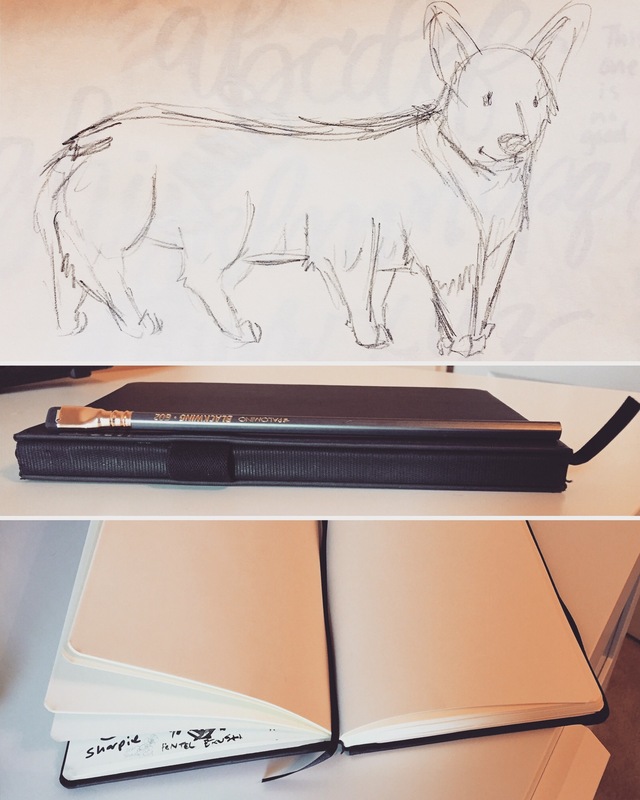 Picking one notebook among a huge host of awesome designs was challenging. I convened a panel of the coolest people I knew to weigh in on my life choice. Ultimately I went with a blank Copper Frost. …but also ended up with a lined Mandala Bloom and a lined Meadow Lark! I’ll be spreading the generosity with a giveaway on Instagram. In case you’ve forgotten, generosity and general goodness is sort of baked into the fabric of Denik as a company, with purchases supporting the artists who designed each notebook as well as helping third world communities where they’re building or have built schools. More here. I don’t really need to go into detail on the artwork, because it all speaks for itself. Freaking beautiful designs. I love them. I want them all. If I were made of endless dollars and thoughts to fill them all, I might actually buy all of them. But I’m not. So let’s get to the actual construction. I carried this notebook for about a week strapped onto the top of my lunchbox like a culinary stationwagon topped with creativity. I may not be as painfully hip as the beautiful people in the Layflat advertisements carrying their Layflats to all sorts of fancy trendy outdoor places, but I can fit at least a month’s worth of notebook abuse into a week or so. A pancake stack would be more physically nutritious, but a notebook stack is more mentally nourishing? The only damage I’ve done so far is a little wear to the copper foil. The cover is still delightfully textured with its soft-touch velvet laminated cover. It’s this magical smooth matte finish that you just want to rub all over your face. It’s also water resistant, though I wouldn’t go so far as to drop it in your nearest body of water. Just no need to fret if you set it on a wet desk or countertop. Layflat. Flat. Lay….flat. Life flat. Life flight. Life Alert. My notebook has fallen and can’t get up. Because it lays flat, you see. Alright, time for a nap. I was surprised to see that all my pressing open of this notebook has not resulted in any cracking of the spine. No doubt due to the smyth-sewn binding. It doesn’t exactly lay flat on its own unless it’s open right in the middle, but it lays quite flat to use. Significant effort is not required to make it flat. Once again, the paper isn’t perfect but did bring some pleasant surprises. I was not expecting to see shading like I got from the 1.9mm Lamy calligraphy nib loaded with J. Herbin Indien Orange, and with no bleedthrough to boot. But with broad and/or juicy fountain pen nibs, you get some spots of bleedthrough, and some feathering (mostly feathering moreseo than fuzzing). This isn’t going to be a book to draw in with heavy applications of fountain pen ink. Watercolor washes also didn’t do very well. That said, small applications of watercolor did great, no bleedthrough. Fine nib sketching with Rohrer & Klingner’s two iron gall inks (Scabiosa and Salix) gave crisp lines with no bleedthrough. Brush pen full of fountain pen ink was a no, but the Faber Castell PITT Artist Pen brush pen was a yes. For writing, the situation was similar. Some bleedthrough on the broader, juicier, heavier sorts of pens, but not much that was too egregious. With these notebooks, it’s worth your time to draw/write up a test page to figure out what all combos work best for you. 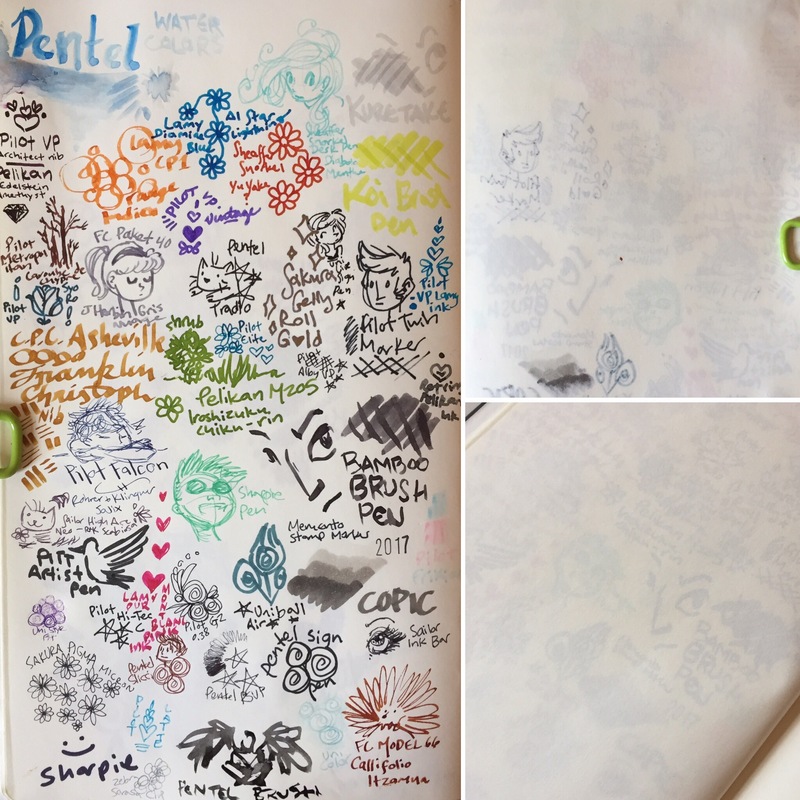 For me, the sketchbook works best with pencils (wooden and mechanical), ballpoint pens, thin gel pens, Sakura Pigma Micron pens, PITT Artist pens, Uni Live Sign Pen, Sharpie pen, and fountain pens with thin nibs/crisp italics, especially with Scabiosa and Salix as the inks. And some spots of watercolor. I went to a prestigious university and what do I remember? This. Mostly this. For the mixed media experience, I present to you washi tape on a precious adoptable catvertisement, and Dadaist poetry secured in poem 1 by generic tape, and in poem 2 by Zig Memory System 2 Way Glue pen glue. I think we’re done here. These are wonderfully portable notebooks in my favorite size, in a wide range of enviably attractive cover designs. The blank style is good for basic sketching techniques but not really the place for heavy media and tons of ink. 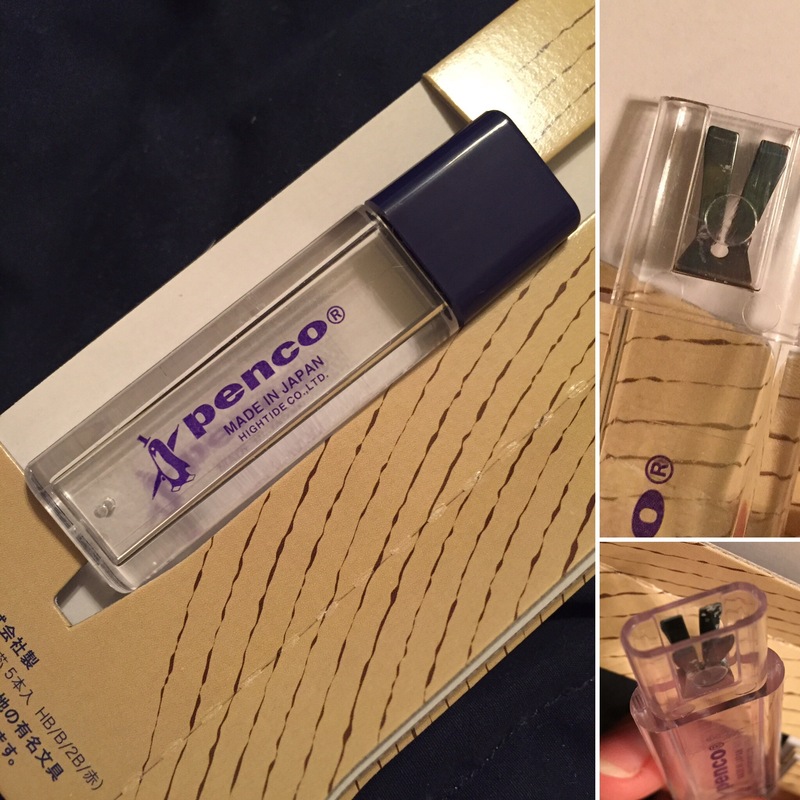 Provided you’re using the right pen and/or ink, you can use both sides of the page in the lined version. 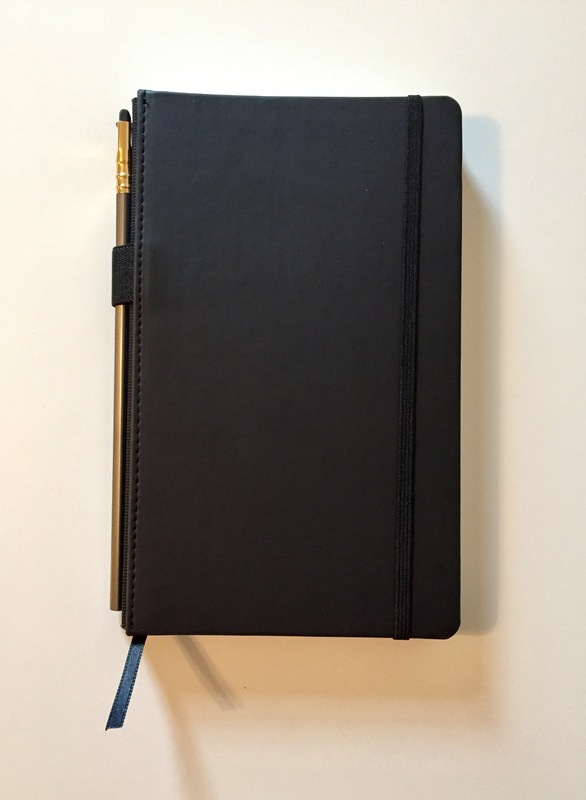 Priced at $11.95, I think it’s a good deal for a good notebook supporting good causes.